- Christian Göldenboog & Oliver Rüther im wunderbaren Buch ?Die Champagner Macher? : ?Bei Hebrarts Champagner komm stets Freude auf, so als hätte die Horn-Section von Earth, Wind & Fire gerade zum Blasen angesetzt, beim Blanc de Blancs ebenso wie beim Brut Selection, bei dem zwei Drittel blaue Tauben für den Biss sorgen." - 92 Punkte Robert Parker's WINE ADVOCATE (11/2013), David Schildknecht: "A 65-35 Pinot-Chardonnay split dominated by 2008 with 20% combined from 2007 and 2006, Hebrart's NV Brut Selection is intensely herbal in a positive way, redolent of cilantro, mint and eucalyptus that convey a cooling and cleansing aura to its texturally polished palate. Chew of apple skin and piquant tang of pear skin engender invigoration, while lobster shell reduction supplies mouthwateringly sweet savor and sense of richness in a persistently juicy, chalk-kissed finish. This outstanding value (by Champagne standards) is sure to be worth following for several more years. - 91 Punkte WINESPECTATOR (10/2015): "Lightly toasty and creamy in texture, this compact Champagne offers rich hints of pastry and crushed almond, enlivened by mouthwatering acidity and flavors of apricot, lemon pith and orchard blossom, with a minerally finish. Disgorged May 2014. Drink now through 2020." - 92 Punkte VINOUS, Antonio Galloni (11/2014): "Pinot Noir takes the leading role in the NV Brut Sélection. Ample, expressive and resonant in the glass, the Sélection is a wine of texture. Layers of fruit build in an arrestingly beautiful, vivid Champagne to drink now and over the next decade. The Sélection is 65% Pinot Noir and 35% Chardonnay based on 2009, with 28% reserve wines from 2008 and 2007. Disgorged April 2014. Dosage is 7.6 grams per liter. 2014-2021." - 90 Punkte VINOUS, Josh Raynolds (1/2015): " (65% Pinot Noir and 35% Chardonnay, with 7.6 g/l dosage; disgorged in April, 2014): Light, limpid gold. Ripe pear, peach pit, honey and buttered toast on the deeply perfumed nose and in the mouth. In a plush, weighty style, with good back end thrust and subtle smoke and anise nuances emerging on the back half. Closes on a chewy note, with lingering spiciness and a touch of bitter quinine." - *(*) Champagner Spezialist PETER LIEM: "Most of this is pinot noir from 40- to 55-year-old vines in Mareuil, while the 30 percent of chardonnay in the blend is half Mareuil and half from Oiry and Chouilly. 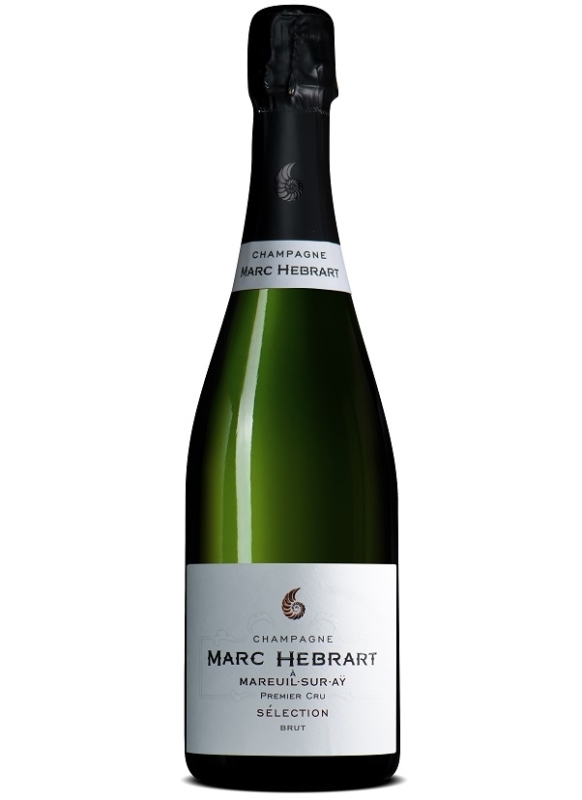 It?s 85 percent 2012, with 15 percent of reserve wine from 2010, and the concentration of the 2012 vintage is evident, making the wine feel big and bold while retaining the elegant poise and refined build typical of Hébrart?s champagnes. It finishes with finesse and length, and it promises to develop more complexity with further aging in the cellar. Last tasted: 3/17"
- 92 Punkte TYSON STELZER: "For its age, pinot noir predominance and depth of reserves, the hue is an impressive pale straw. The body, depth and poise of Mareuil shine in a style of red apple and strawberry fruit, supported by the ine texture and subtle almond-meal notes of long lees age. Fine acid line and soft minerality define a long finish of well-integrated dosage. A triumph for 2011 and great value."